Creative Drama in the Classroom and Beyond 8 Edition Encouraging both teacher and student imagination and expression, the seventh edition of this classic text helps future teachers integrate drama into elementary school classrooms and introduces students to a variety of genres and strategies, including mime, play structure, improvisation, and using drama the special education curriculum. 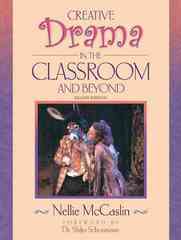 Unlike other texts, McCaslin focuses on drama as an art form as well as a teaching tool. The seventh edition features broader coverage of middle school, high school, and adult learners.